A native Virginian, Henry Taylor earned degrees from the University of Virginia and Hollins College. 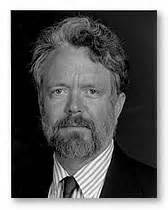 In 1986 he received the Pulitzer Prize for The Flying Change, and his later poetry collections include Understanding Fiction: Poems 1986-1996 and Crooked Creek. He also published many translations of classic texts. He received a Witter Byner Prize and fellowships from the NEA and the NEH. He taught literature and co-directed the MFA program in creative at American University from 1971 to 2003. “The Hayfork” first appeared in Shenandoah 48/2. I might get over there one of these days. on either side of a wagon-wide aisle -way. A rail under the ridgepole ran gable to gable. stood out like white spots on a heifer. drawing the load up under the rail and the trip-stop. with two barbed ends that grabbed the wads of hay. where men forked it away for the winter. at the grain in the wood of this kitchen table.